Are you looking for some french knitting instructions? This is a great craft/knitting activity that you can do with the kids. It is reasonably quick and easy to do and will keep them amused for quite a while. One of my grand-daughters started some french knitting months ago and keeps going back to do a little more each time she comes to visit. French knitting is basically knitting a narrow tube or cord usually on 4 stitches. 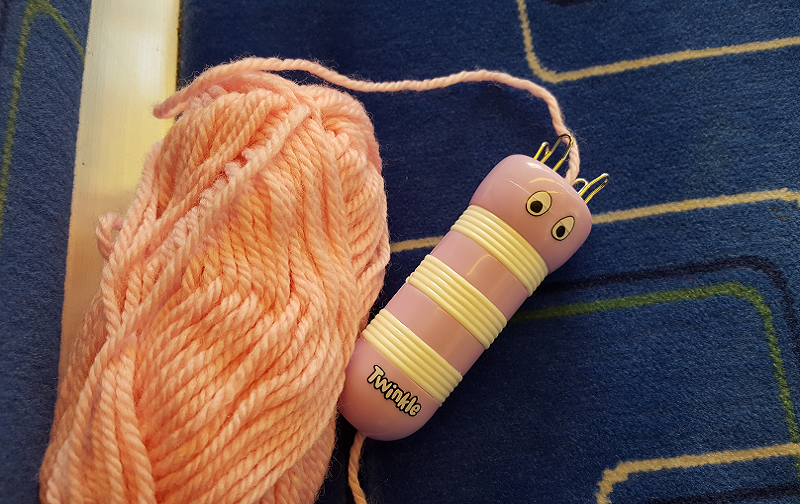 You can use the cord to decorate other knitted items, to create headbands or make animals shapes, or you could coil your french knitting into a mat. First you are going to need to get your hands on a French Knitting tool, this is important as you will not be able to do your french knitting without one. Basically these tools are a tube (usually made out of wood or plastic) with a hole running down the centre - this is where your knitting sits as you add rows. At the top of the tool there is a row of nails or small pegs around the hole in the centre - usually four but there may be more on your tool. These nails or pegs hold the stitches for your knitting. 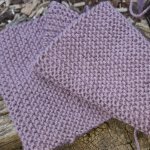 Your tool should come with a small needle or hook that is used to create new stitches, and of course you will need some wool or yarn to work with. Insert the tail of your wool into the hole in your tool (from the top to the bottom) leaving a reasonable length at the bottom of the tool. 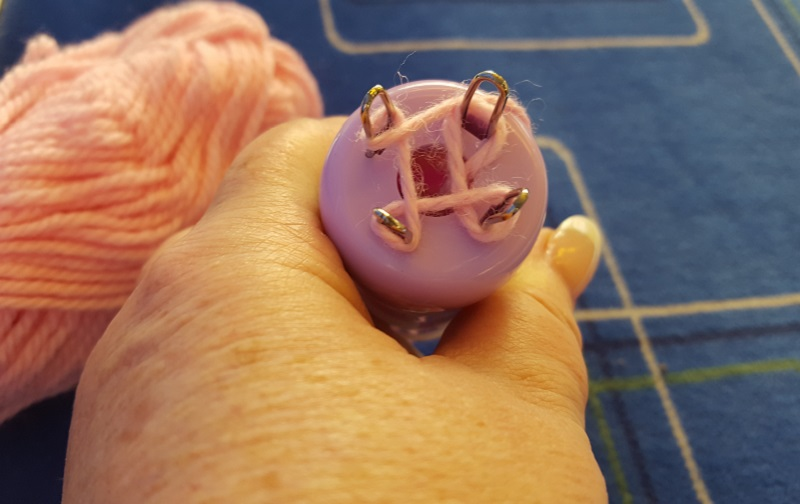 To 'cast on' wrap your wool around each peg as shown in the image. Take the tail attached to the ball of wool and wind it around the outside of the pegs above the loops you made in the previous step and hold it to the side fairly tightly with one of the fingers on your left hand. Use the tool to lift the stitch up and over the wool, lefting it fall to the back of the peg to form a new stitch. Give the tail at the bottom of the tool a gentle tug so that the new stitch sits neatly on the peg. 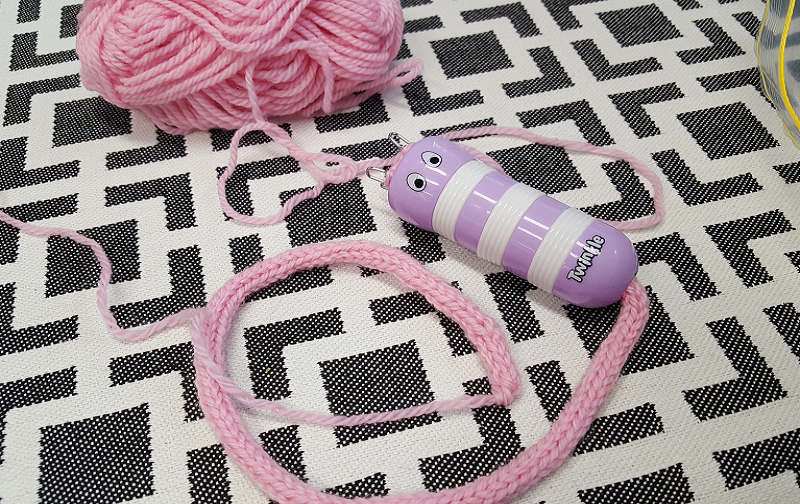 Now repeat this step for all of the other pegs on your tool and just keep going until your french knitted cord is the length you want it to be! Then you cut the wool and use a knitters sewing needle to thread the tail through all four stitches and pull tight. Of course, these days, you don't have to do it all by hand if you can source a french knitting machine. Here in Australia, you can buy them from Spotlight or you might see an advert for one on Facebook. 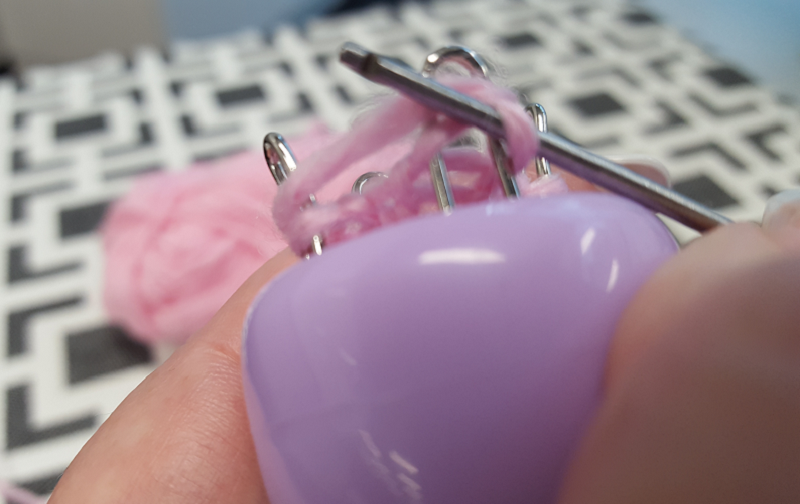 With these gadgets, all you need to do is thread them correctly and then wind the handle. Winding the handle causes the needles (rather than pegs) to move up and down as the yarn winds around the top forming the stitches as it goes. If it is the end product rather than the process that interests you, knitting cords on a circular needle (or a solitary double pointed needle) is faster than french knitting and produces a very similar result. Basically to knit a cord you cast on 4 stitches and knit a row. Then you slide your knitting to the other end of the needle, pull your tail around the back of the work to knit the first stitch again. So you are knitting in a circle rather than back and forwards as you do when you are knitting flat.